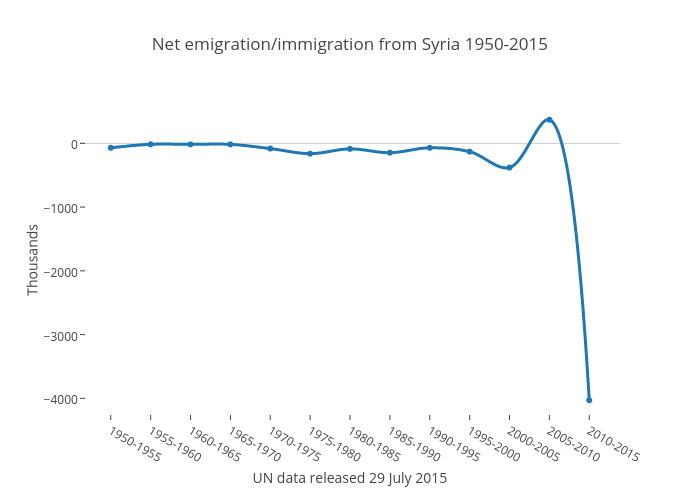 Benparker140's interactive graph and data of "Net emigration/immigration from Syria 1950-2015" is a scatter chart, showing Col2; with UN data released 29 July 2015 in the x-axis and Thousands in the y-axis.. The x-axis shows values from -0.740872662511131 to 12.740872662511132. The y-axis shows values from -4338.975712777191 to 678.9757127771911.